The first issue of this series is one that I’m extremely familiar with…there are only a handful of such comics in my lifetime that I have that familiarity with. This issue, though…if I’ve read it before, it’s almost certainly been nearly two decades–or more! This issue opens with several pages of a woman with powers being chased, as she tries to get to our hero. We cut to the funeral of the police officer Hardcase failed to save last issue, and his meeting with the officer’s brother. And even at a FUNERAL, Hardcase is pestered for autographs [[[as I type this, having just read about some recent Stan Lee stuff, I’m extra disgusted at the notion of autograph-hounds]]]. We find that the woman is Choice–a spokesmodel for the corporate entity. Hardcase talks to his agent, and whil eon the phone, the woman finds him, levitating to his balcony. They’re almost immediately attacked by parademon/Lexcorp-looking armored flying soldiers, who severely damage (if not destroy–it’s not completely clear) Hardcase’s not-so-humble abode. The rest of the issue is an extended fight sequence with Hardcase and Choice fighting the soldiers, who eventually claim they’re “just” trying to bring her in because she’s crazy and should be in a mental institution. 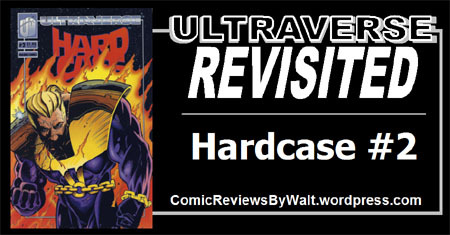 Hardcase is highly ticked-off, and we end the issue on him determined to take the fight to the corporation for some answers. The art for this issue is fairly inconsistent. I don’t think I’d consider any of it particularly bad or anything, but there’s a definite inconsistency throughout the issue. The “artists” (plural) credit of a STUDIO seems to me to suggest a bunch of people all working together on it, rather than any singular artist on pencils with a single inker and maybe a couple of colorists or letterers or such. It’s definitely a different look as well from the first issue, and had this been a present-day 2018 issue, I’d probably consider dropping the series for that alone. That said, I’m not an art-guy, and the art does tend to convey the big action and stuff that’s going on, getting the visuals across, however inconsistently. 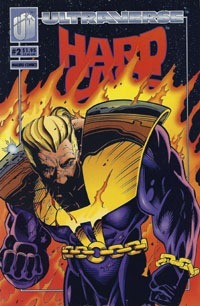 The cover is pretty basic–just a close-up (yet deeply shadowed) image of Hardcase with a blazing fire in the background, and some flames on the ginormous shoulder pads/chest armor he wears. Nothing horrid, but not a scene from the issue, really, nor all that dynamic…while the first issue’s cover is rather “iconic,” this just feels like some random/generic image slapped on. The story is better, though still feels a bit basic…at “only” a #2 of an all-new, brand-new character and still-new “world,” we have world-building, particularly the addition of Choice and that corporation, and little hints here and there to other corporate crap going on. We get tossed-in tidbits of Hardcase being this huge movie star/hero, though I still don’t “buy” his rise to SUCH stardom in only a year, even if he WAS a part of THE only team of ultra-heroes for a time, first. I recall stuff with Choice in a later issue and/or “meta” knowledge I found out perhaps from Wizard Magazine or Hero Illustrated, so I know she’s an important addition to the cast. 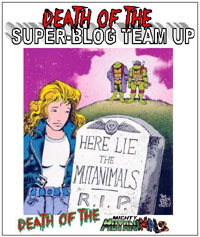 I also am very conscious that for the most part, the bulk of the Ultraverse only REALLY lasted a couple years–that by the time any of the titles got to their “teens” or around #20 or so (I think the highest issue number an Ultraverse issue got was #26–with Prime and Hardcase)…so “only” 2 issues is still a pretty significant chunk of the entirety of any of the series. As with Strangers #2 and Prime #2…I would not specifically seek out this issue as a stand-alone read, unless you’re missing it from completing a run or part of the run. This definitely builds from the first issue, and continues the building heading into the third issue. “Iffy” as the issue is as a standalone…I think I’d still recommend it on the Ultraverse brand, and as part of the series…though I would not counsel paying much for it (or any of the “regular” issues)…these are very much stuff for the bargain bins, up to $1 or so each, ideally. I’m pretty sure the issue after #1 that I’m most remembering is #5 (the Rune Month issue) and then somewhere in the teens with the return of NM-E and then stuff in the lead up to Black September after Godwheel…so (like with The Strangers) this series as individual issues and specific details reading issue by issue is actually new to me, all these years after original publication.